St. James Academy is a leading independent school in the Baltimore area for students in Grade K-8. The Academy is dedicated to providing a program of excellence, while developing each student’s highest potential in intellect, character, and physical well being with a global perspective. In addition, St. James Academy fosters a partnership between students, parents, and the community. The academic program includes accelerated instruction in math and reading. It also includes technology integrated with iPads, laptops, smartboards, LEGO robotics, design software for the 3-D printer, and a new state-of-the-art makerspace. The arts program includes visual art classes, chorus, band, instrumental lessons, and three musicals per year. The Academy offers a well-designed physical education program, plus interscholastic athletics and recreation council teams for all ages. Students attend weekly chapel service and participate in a Middle School development course. St. James Academy’s state-of-the-art makerspace is outfitted with white board covered tables and surrounded by gadgets and various power tools and measuring devices. Students work with LEGO robotics, electronic components, LED light sets, and a 3-D Printer. The space has plenty of power outlets and network connectivity. Students use their knowledge and skills to develop solutions to meaningful problems in the community. St. James Academy’s makerspace program is designed to inspire students to brainstorm, collaborate, explore, discover, think outside the box, and fail forward. 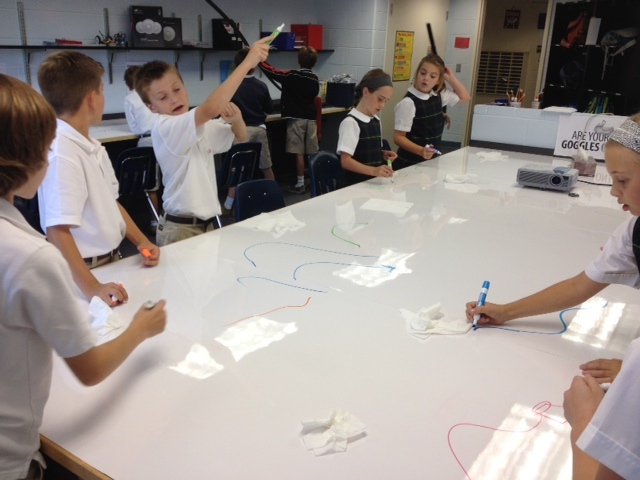 In the Lower School, students work in the makerspace during their design thinking time. Students are encouraged to identify and create meaningful solutions to different problems. Students work collaboratively to follow the design process, which calls for each group to think, make, test, and improve. In the Middle School, students explore physical computing which allows students to apply programming skills to physical objects. These types of projects enhance the lesson by combining the core subject with the leveraging of the available technologies. Incorporating these types of lessons will enable independent, critical, and creative thinking. The philosophy of St. James Academy fits well with the plans for the makerspace. These activities are hands on and help the students to stay engaged, foster creativity, and explore. The lessons are built to encourage open-ended conversations. Students aren’t following a set of instructions, but rather trying, failing, and adjusting ideas to find a solution to the problem. The makerspace is a wide-open space. Many activities are student lead inquiry based and involve mind mapping on the white board tables for idea generation, space for the objects built to move, fly, and glide, and a space for student collaboration. Prefirst: One of the Prefirst students had spent a Saturday with his dad making prosthetic hands for children in Syria. The hands were inexpensively made using a 3-D printer. When he shared his activity with the class. The students did not quite understand how a 3-D printer worked. To illustrate this to the class, students created a Christmas tree on the printer and simultaneously made a tree by hand. The children made paper trees in the makerspace while, one by one, each child got to get a close up look of the 3-D printer making the tree. They saw the computer drawing of the tree and then watched the tree appear before their eyes on the printer. Second Grade: Students worked on an engineering problem that involved critical thinking, exploration, and creative problem solving. The students had to create a mini igloo, out of sugar cubes and icing, that was architecturally complete. The students ran into a lot of problems; however, they had to adjust their ideas to find a solution to the problem. Middle School: Middle School students are given an opportunity to explore new ideas and incorporate these ideas into best practices. Students have created several objects on the 3-D printer. These different projects enhance the students’ learning experience. St. James Academy plans to keep dedicating classes and open space to discovery, exploration, and creativity. Plans are already in progress to expand on the curriculum and to continue to offer tools that support teachers’ lesson plans for design thinking time. Also, students will start to develop solutions to common problems teachers find within the school while incorporating non-electronic means of fabrication (ie. sewing, clay modeling, woodworking, etc.) Joe Edel, St. James Academy’s Tech Coordinator, has plans to transform the makerspace into an interactive sensory experience, and add a CNC cutting machine.